It’s one part Lemmings, one part Tetris, and many parts Furballs! Welcome to this fantastic video slot produced by Core Gaming, as we join Roland, Boomer, Anita, Frosty, Sparky and Wiggy in this fun-packed adventure in search for big prizes. Strap yourself in – there’s a ton of features to read about! Bet from as little as € 0.1 up to a maximum of € 100; with the game having an RTP that can reach up to 97.71%. 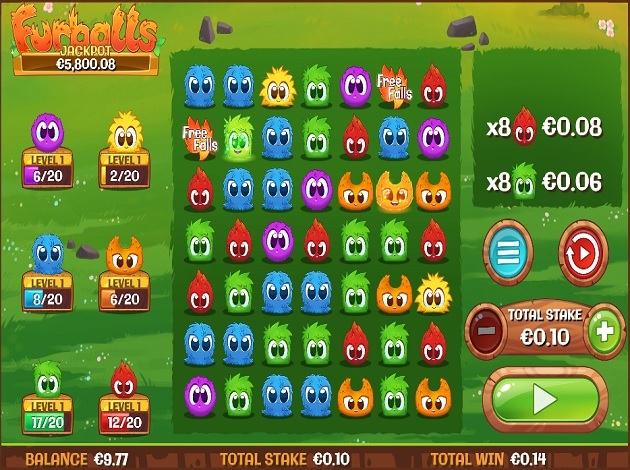 You receive a payout whenever 5 or more connecting symbols land on the reels – a bit like Tetris, and the connecting Furballs will disappear, leaving new Furballs to replace them. This video slot though offers more than just the Tetris experience, with a lot of features that will make your gameplay more fun, and more rewarding. Power Symbols can show up on the reels out of nowhere – and what they do is that they blast Furballs off the grid without giving you a payout. This, however, may create extra cascades which can create connecting wins. There are three types of Power Symbols. The Energy Ball bursts the surrounding Furballs around it; the Lightning Ball removes Furballs horizontally or vertically using a cross-shaped beam; the Virus Ball contaminates any Furballs touching it and removes them from the grid. Five or more Furballs with a glowing Furball of the same colour will add a unit of XP to the corresponding Furball level. Each of the six Furball levels has 20 XP units and once these are all achieved, the corresponding bonus feature will be awarded. Your average bet amount will have an effect over each bonus feature and once a bonus feature has been played for five times, the Furball will level up and the prizes you will receive from that bonus will be worth more. The Free Falls Trigger comes into action with three or more connected Free Falls symbols – Free Falls here refers to a Free Spins mode. The more Free Falls symbols you land, the more Free Spins you get, with a minimum of 8 and a maximum of 15 Free Spins. The good thing about this is that all your payouts are multiplied by an amount of between 2x and 6x, and the multiplier is always chosen at random before every Free Spin. You also get additional Free Falls with three or more Free Falls symbols landing on the reels during this mode. The Progressive Jackpot can be won during the Free Falls feature – after your last Free Fall, you will be taken to the jackpot tree and if the seven letters of “JACKPOT” fall from the tree, then the big prize is yours! Every Furball has his own bonus minigame. The Furball Heights Feature is triggered when you get 20XP units on Wiggy’s (green furball) level. You get to choose from among Wiggy Furballs to find out what’s underneath – you could either find a conker or a cash prize. The Wild Fire feature is triggered when you fill Sparky’s level, and you will get more wilds per fall, which substitute for all the regular symbols during the Free Falls. The Skid Row feature is triggered with 20 XP units in Frosty’s (blue) level. Move Frosty through the maze to collect acorns and coin stacks until Frosty falls in an ice pothole. In the Nut Drop Feature, Anita moves from left to right to catch as many acorns with prizes as possible. The purple Furball (Boomer) is the star of the Mine Raider feature, where he will move along the trail collecting gems until he’s blocked by a wall of stone – or dynamite. The dynamite will clear Boomer’s path but if you are stopped by a stone, the mode ends. Finally, the Rolling Hills feature sees Roland go up and down hills and platforms collecting coins and gems until he arrives home. In descending order, the highest paying symbols are the Free Falls symbol, then Roland, Boomer, Anita, Frosty, Sparky and Wiggy. The green grass serves as a background for the reels, from which the furballs stare curiously at you. The interface is designed for high-quality graphics – obviously, cartoonised – while the game controls lie on the right-hand side of the reels. At the bottom of the screen, you’ll find your balance, bet amount and last total win. Furballs is indeed a spectacular video slot with many bonus features and an RTP that can reach up to 97.71%. Sit back and enjoy these furry friends’ mischief as they fall onto the reels to bring you prizes and big wins! Core Gaming creates games in-house and they have a strong team developing one great game after another. In addition, they also co-operate with many famous names in the industry, which gives them, for example, opportunities to widen their game distribution to bigger audiences. These days, you will find Core Gaming’s games from many of the big casino operator’s game selection. Other games from Core Gaming offered at Videoslots.com are Captain Cashfall, Beehive Bedlam, BarStar, and Mandarin Orchid.